Years ago while in college I decided to try cooking a pork tenderloin one night. It was a pre-seasoned loin that came with directions on how you should cook it. As this was at the one of the first meats I tried to prepare on my own, I did my best to carefully the directions as best as I could. The end result was horrible! The tenderloin was dry, hard, and completely flavorless. For the next 6 years every time I went shopping in the meat department of the supermarket I would head for the chicken, beef, pork chops and always passed up the pork tenderloin. After such an epic fail I was determined I would never try cooking that again! Well recently, I came across this recipe for Orange-Chipotle Glazed Pork Tenderloin and it just looked amazing! Although I am not a big fan of orange, I knew that I could turn the orange-chipotle glaze into a honey-chipotle glaze which is one of my most favorite sauces to have when eating chicken crispers at Chili’s. I decided that after years of cooking under my belt now, that this tenderloin would be successful. As I started to prepare the recipe I kept all of my fingers and toes crossed! WOW, I cannot believe that I hesitated to cook pork tenderloin this long. Boy have we been missing out! The tenderloin turned out amazing flavorful and was so incredibly moist that the meat just melted in your mouth. Once you have the base down on how to cook a tenderloin, you can easily adapt this recipe with any sauce, glaze or stuffing that you can dream of! Preheat the oven to 375 degrees. Prepare a roasting pan or baking sheet with wire rack by lining the bottom with tin foil and setting aside. In a medium sized bowl whisk together the honey, bourbon, chipotle chilies, adobe sauce and 3 teaspoons of the maple syrup. Set aside. Trim all the excess fat off of the pork tenderloin and pat dry. In a 9×13″ baking dish whisk together the cornstarch, sugar, salt and pepper. In a large sauté pan over medium-high heat, heat the vegetable oil until it is almost smoking. While the oil is heating, roll the tenderloin in the dry ingredients mix until well coated, shaking off any excess powder. Brown the tenderloin in the sauté pan until all sides are golden brown, which will take approximately 8-12 minutes. Once the tenderloin is browned, remove it from the sauté pan and place it in your prepared roasting pan. Turn the heat down on the sauté pan to medium and add the glaze mixture to the pan. While scraping the bottom of the sauté pan to remove all the caramelized goodness, simmer the glaze for 2-4 minutes until slightly reduced. Remove 2 tablespoons of the glaze and set aside and then pour the remaining glaze into a small bowl. Lightly glaze the pork tenderloin. Roast the pork tenderloin in the oven until it reaches 140-145 degrees, which will take anywhere from 15-25 minutes. Every 8 minutes, lightly glaze the pork tenderloin again with the glaze. Remove the tenderloin from the oven and allow it to rest for 8-10 minutes, uncovered. While the tenderloin is resting, adding the remaining 1/4 cup of maple syrup to the reserved 2 tablespoons of the glaze and whisk together. 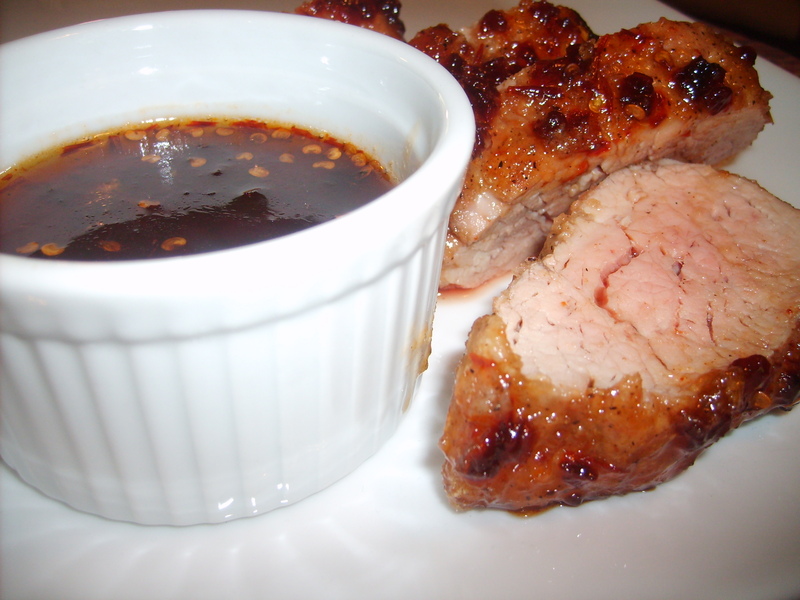 Slice and serve the pork with the glaze dipping sauce!